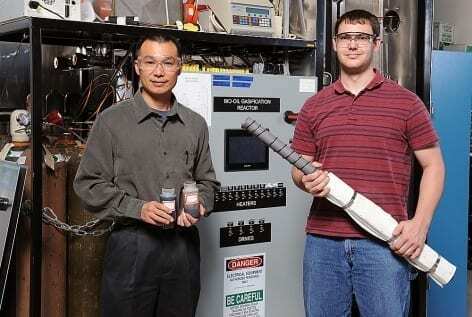 That gas can be processed into transportation fuels. The 6-inch diameter, stainless steel pipe is the pressure vessel, which is essential for the system’s operation, said Creager, a doctoral student in mechanical engineering andbiorenewable resources and technology. It’s a little over three feet long and about a foot across. It can contain pressures up to 700 pounds per square inch.